After the Executive Breakfast at BRMConnect 2018, a group of execs gathered to hear Kip Fanta present the BRM Executive Briefing and discuss the exciting future of business, as a function across the organization converge and share ownership of strategy and success by advancing their existing business relationship management capability. During his invigorating presentation, Kip called upon everyone, not just executives, to participate in shaping that future. His logical explanations and clear vision set the tone for a clarity of purpose as the day progressed. Before we begin to take actionable steps, we must become aware that the age of the service provider is over. IT, HR, Finance, and other areas are no longer stuck in their own box, to be treated as separate from the business side of an organization. Instead, BRMs operate across functions, tying each one together with their overall enterprise knowledge and sharing in ownership of results. However, to drive value, BRMs must break away from a silo mentality, and move towards a culture of shared ownership. First, to create shared ownership, Kip highlights that business functions must take part in key decisions from the ground up. Consequently, he stressed proactive involvement in the business strategy. Proactive involvement entails including BRMs from all areas of the organization, and externally to the organization, in the process from ideation through value optimization to ensure value recognition across the organization and beyond. Alas, many organizations today do not view IT, HR, finance and other areas in this light. To obtain strategic partnership with business as business, Kip recommends we utilize two simple approaches. First, as difficult as this may be, ask your organization’s leadership, “What is the business’ view of our function?” This encourages open communication and transparency—the first steps in any productive relationship. After you’ve settled where you fall in the BRM Maturity Model, explain to your leadership why your function should seek a strategic partner level. Doing so will demonstrate value contribution, competence and leadership to the team. These important, yet subtle, changes reflect the evolving relationship between business and IT. They highlight where we want to go, rather than where we have been. 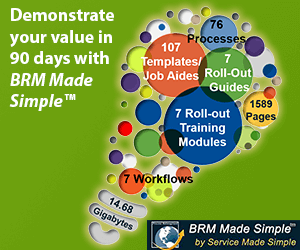 Despite the promising future of BRM, a lack of awareness remains one of its largest hurdles. We combat this by envisioning our future roles in business, and by acquiring the necessary tools and knowledge. BRM Institute defines a BRM capability as a capability designed to stimulate, surface, and shape business demand across all functions (business units, sales, marketing, technology, HR, finance, etc.) and ensure that the potential business value from that demand is captured, optimized, and recognized. A strong BRM capability converges cross-functional teams and eliminates value-depleting organizational silos. It strengthens collaboration and drives a culture of creativity, innovation, and shared ownership across the enterprise, so that holistic, innovative, and value-driven strategies are created and deliver their intended business value results. Fortunately, BRM Institute provides an array of resources for success through the global BRM community through mediums like BRMiBoK that house the BRM standards, and the Online Campus. Kip’s closing remarks summarize the message succinctly, yet powerfully.